The presence of serum autoantibodies is commonly associated with autoimmune diseases including rheumatoid arthritis (RA), type 1 diabetes (T1D), and systemic lupus erythematosus (SLE) (1–3). These autoantibodies include antinuclear Abs (ANA), Abs to dsDNA, Sm, nuclear ribonucleoprotein, Ro, La, and phospholipids in SLE (1); rheumatoid factor and Abs to cyclic citrullinated peptides in RA (2); and Abs to insulin, glutamic acid decarboxylase (GAD65), the 40K fragment of tyrosine phosphatase (IA2), and zinc transporter 8 (ZnT8) in T1D (3). Autoantibodies against cell surface Ags associated with the nervous system have been linked to several neurologic diseases (4). In particular, autoantibodies to aquaporin 4 (AQP4) are associated with neuromyelitis optica spectrum disorders (NMOSD) (5, 6). Autoantibodies to myelin oligodendrocyte glycoprotein (MOG) are associated with a relatively stereotyped set of clinical presentations including recurrent optic neuritis, acute disseminated encephalomyelitis, pediatric acquired demyelinating syndrome, and NMOSD without AQP4 autoantibodies (7–13). Finally, autoantibodies to the acetylcholine receptor (AChR) and to muscle-specific kinase (MuSK) are associated with myasthenia gravis (MG) (14, 15). Although most autoantibodies exhibit varying degrees of specificity toward one autoimmune disease, the presence of the same autoantibodies in different autoimmune diseases could reflect common genetic influences, common epidemiologic relationships, or other common mechanisms contributing to dysregulated B cells that produce autoantibodies (16). One such example is the presence of nonneurologic autoantibodies such as ANA and dsDNA in both nonneurologic (SLE) and neurologic (NMOSD) autoimmunity, possibly reflecting common elements of pathophysiology between SLE and NMOSD (17). In the current study, we sought to expand cross-disease autoantibody exploration to include four validated neurologic autoantibodies (MOG, AQP4, AChR, and MuSK) in nonneurologic autoimmune diseases. In particular, we examined both organ-specific and systemic nonneurologic autoimmune diseases (T1D, RA, and SLE), while simultaneously controlling for the neuro-SLE subtype. We additionally examined a control cohort of neurologic autoimmune diseases (multiple sclerosis [MS], NMOSD, and other neurologic disorders [OND]). Detection of neurologic autoantibodies in nonneurologic autoimmune diseases would indicate that a loss of tolerance toward nervous system surface Ags is a global event across neurologic and nonneurologic autoimmunity. It would further indicate that neurologic and nonneurologic autoimmune diseases share pathogenic elements that lead to similarly dysregulated, autoantibody-producing B cells. This study leverages four large and well-characterized patient cohorts with matched control samples from major United States academic centers that specialize in each respective disease. The strength of this multicenter study is the combination of well-curated specimens with thorough, state-of-the-art autoantibody detection techniques. Data from this study are anticipated to establish baseline rates of neurologic autoantibodies across several diseases. This study was performed in accordance with the Helsinki Declaration under protocols that were approved by the institutional review boards of the Benaroya Research Institute, the University of Colorado, the Oklahoma Medical Research Foundation (OMRF), and the Yale University School of Medicine. Written and informed consent was obtained from all subjects or legal representatives before any study-specific procedures. Specimens received at Yale from other institutions were deidentified. Four cohorts were examined (RA, T1D, SLE and neurologic [MS, NMOSD, OND]). As the cohorts originated from different sites, site-specific, matched healthy controls were included for each cohort. Comprehensive clinical and demographic information were available for all individuals. The RA samples were derived from the Studies of the Etiology of RA cohort, established at the University of Colorado (18). RA patients met at least four 1987 American College of Rheumatology (ACR) RA classification criteria (19). The T1D cohort was established at Benaroya Research Institute. T1D patients met the 2010 American Diabetes Organization criteria (20). The SLE cohort was derived from the Lupus Family Registry and Repository, established at OMRF (21, 22). SLE patients met at least four American College of ACR SLE classification criteria (23). The SLE-neuro subset included patients who met the ACR classification criteria for neuropsychiatric lupus syndromes (24). The neurologic (MS, NMOSD, OND) cohort was established at the Yale University School of Medicine, Department of Neurology. MS patients met the 2010 McDonald criteria, and NMOSD patients met the 2015 NMOSD consensus criteria (6, 25). OND and MG patient samples were collected from the Yale Multiple Sclerosis and Neuromuscular Clinics. MG diagnosis was based on both clinical criteria and autoantibody status. Expression vectors were constructed by cloning cDNA encoding full-length human MOG (26), AQP4-M1 isoform (27, 28), or rapsyn (29) into pEGFP-N plasmid vectors (Clontech, Mountain View, CA); these vectors were kindly provided by Drs. M. Reindl of the University of Innsbruck, S. Hinson and V. Lennon of the Mayo Clinic, and D. Beeson of the University of Oxford, respectively. The cDNA encoding human AChR α-, β-, δ-, or ε-subunits (29) was cloned into pcDNA3.1-hygro plasmid vectors (Invitrogen, CA) and cDNA encoding human full-length MuSK (30) was cloned into pIRES2-EGFP plasmid vector (Clontech). AChR and MuSK vectors were kindly provided by Drs. D. Beeson and A. Vincent of the University of Oxford, respectively. Human embryonic kidney 293T cells (HEK293T) (CRL-11268; American Type Culture Collection, Manassas, VA) were transfected as previously described (29, 31). Briefly, HEK293T were transiently transfected using polyethylenimine (PEI) for 16 h with plasmid vectors encoding either MOG-EGFP, AQP4-EGFP, adult AChR, and rapsyn-EEGFP (with α-, β-, δ-, ε- subunits and rapsyn-EGFP in a ratio of 2:1:1:1:1), or MuSK-EGFP. Transfections using PEI with an EGFP-only vector and mock transfections using PEI with PBS comprised negative controls. After a wash step with PBS and a 24-h incubation period, live cells were used for cell-based immunofluorescence assay Ab measurements. Serum was procured at enrollment and stored at −20°C/−80°C. Non-Yale serum samples were shipped on dry ice. Assays were performed on freshly thawed serum samples in blinded batches. Sera from all participants were screened for the presence of autoantibodies with a robot-assisted cell-based immunofluorescence assay as previously described (29, 31, 32). Briefly, transiently transfected HEK293T were trypsinized, washed, and resuspended at 106 cells/ml in PBS containing 1% FCS and 1 mM EDTA (termed FACS buffer). Cells were rotated for 1 h at 4°C, washed and resuspended at 10 × 106 cells/ml in PBS, then stained with LIVE/DEAD stain (L34972; Thermo Fisher Scientific, Waltham, MA) and incubated for 30 min at room temperature. Cells were washed after staining and resuspended at 200,000 cells/60 μl in FACS buffer. All further steps were performed in 96-well plates using the Biomek FXP Laboratory Automation Workstation, a platform that uses robotic automation (Beckman Coulter, Brea, CA) to optimize reproducibility across experiments. For each experiment, 160 serum samples were simultaneously tested in a blinded manner on the following six conditions: MOG-, AQP4-, AChR-, MuSK-, EGFP-, and nontransfected cells (PBS). Each patient serum (at a 1:50 dilution in FACS buffer) was mixed with 200,000 cells and incubated for 1 h at 4°C. Cells were subsequently washed and incubated with secondary Ab (at a 1:1000 dilution in FACS buffer) Alexa Fluor 647 rabbit anti-human IgG Fcγ fragment specific, which specifically does not recognize IgM, (309-605-008; Jackson ImmunoResearch Laboratories, West Grove, PA) for 1 h at 4°C. Finally, cells were washed, resuspended in 200 μl of 2 mM EDTA PBS, and analyzed on a BD LSR II cytometer using the high-throughput screening plate reader (BD Biosciences, San Jose, CA). After exclusion of doublets, live cells were gated on the PE–Texas Red channel. The fraction of transfected cells was measured in the FITC channel, and IgG bound was measured in the Alexa Fluor 647 channel. For each experiment, the Alexa Fluor 647 gate was set on a sample of FACS buffer incubated with Ag-transfected cells. 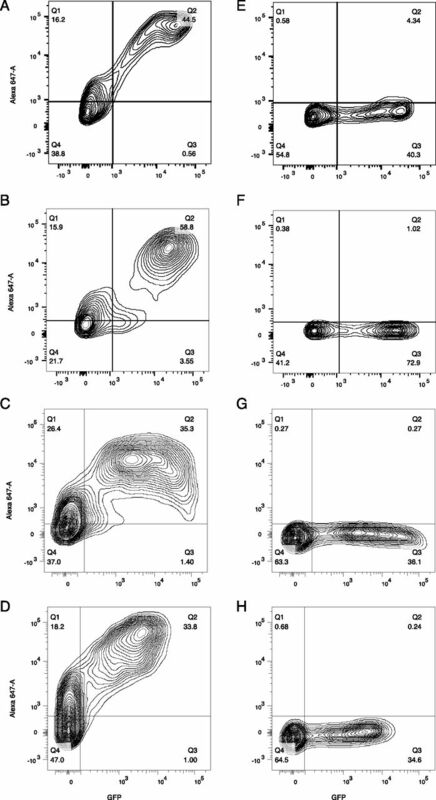 Results were calculated as the difference (Δ) in the percentage of transfected cells that bound secondary Ab (termed positive cells) (31) as follows: Δ% positive cells = (% frequency of positive Ag-transfected cells (quadrant [Q]2)/% frequency of Ag-transfected cells (Q2+Q3) – (% frequency of positive EGFP-transfected cells (Q2)/% frequency of EGFP-transfected cells [Q2+Q3]) (Fig. 1). Every plate included, as positive controls, sera from patients previously determined by routine diagnostics to harbor autoantibodies against MOG, AQP4, AChR, or MuSK. Values (Δ% IgG-bound/-positive cells) both >5 SD above the mean of the matched healthy donor (HD) subjects of the respective patient cohort (RA, T1D, SLE, neuro-SLE, or neurologic [MS, NMOSD, OND]), and greater than a value (Δ% IgG-bound/-positive cells) of at least 10% were considered positive in the robot-assisted cell-based immunofluorescence assay screening. To calculate inter- and intra-assay variability coefficients and the transfection efficiency variance for the cell-based immunofluorescence assay, each Ag (MOG, AQP4, AChR, MuSK) was transfected six times into HEK293T. Four positive control sera (each positive for MOG, AQP4, AChR, and MuSK autoantibodies, respectively) were run in triplicate over cells transfected with their matching Ag. The Δ% of positive cells was calculated for each individual condition. Coefficients of variation were calculated as the SD:mean × 100. Transfection efficiency was quantified as the percentage of transfected cells by means of EGFP fluorescence. For all samples determined to be positive in the screening assay and for which serum was available, validation was performed. For the screening cell-based immunofluorescence assays, we used a cellular system that relied on transfection with the Ag in question and control transfection with EGFP; this system involves application of the same serum sample to two separate wells: one with Ag-transfected wells and one with EGFP-transfected wells. This method offers the advantage of better controlling for potential changes of the cell surface with transfection and hyperexpression and is suitable for screening to maximize sensitivity. This approach, however, can produce false positives because of nonspecific binding of serum Abs to both Ag-transfected and -nontransfected cells (respectively Q2 and Q1, Fig. 1, for Ag transfection) but not to EGFP-transfected and -nontransfected cells (again, Q2 and Q1, but for EGFP-only transfection). Such a phenomenon can produce a Δ% positive cells value above the cutoff, reflecting a binding artifact with Ag-transfected cells but not with EGFP-transfected cells. Calculating the ratio of Δ% positive cells (described above) does not control for such an artifact. We therefore performed our validation using serial dilution cell-based immunofluorescence assays measuring Δ mean fluorescence intensity (MFI) for both MOG and AQP4. For AChR and MuSK we used an RIA. We reasoned that a two-level experimental procedure for the testing of neurologic autoantibodies is most accurate, with the first level offering thorough control for transfection-induced hyperexpression and the second level eliminating false positives. For MOG, validation was performed by serial 3-fold serum dilution cell-based immunofluorescence assays. Sera that were positive in the screening cell-based immunofluorescence assays and additional HD sera (because of limited cohort serum quantity, additional HD sera were acquired from a biorepository at Yale) were manually assayed (no robotic assistance) on the flow cytometry MOG cell-based immunofluorescence assay (31). Positivity was determined by a ΔMFI index; live, single HEK293T were first gated into transfected and nontransfected based on their EGFP expression, and subsequently the mean Alexa Fluor 647 fluorescence intensity for transfected and nontransfected cells was calculated. ΔMFI was defined as Alexa Fluor 647 MFI in MOG-transfected cells minus Alexa Fluor 647 MFI in nontransfected cells. The ΔMFI positivity cutoff for each dilution was set at the HD mean plus 5 SD; ΔMFI values above the cutoff were considered positive. The titer was defined as the highest dilution yielding positive ΔMFI. For AQP4, validation was also performed by serial 3-fold serum dilution cell-based immunofluorescence assays. Sera that were positive in the screening cell-based immunofluorescence assays and additional HD sera (because of limited cohort serum quantity, additional HD sera were acquired from the Yale Neurology Biorepository) were manually assayed on the flow cytometry AQP4 cell-based immunofluorescence assay (31). Positivity was determined by a ΔMFI index; live, single HEK cells were first gated into transfected and nontransfected based on their EGFP expression, and subsequently the mean Alexa Fluor 647 fluorescence intensity for transfected and nontransfected cells was calculated. ΔMFI was defined as Alexa Fluor 647 MFI in AQP4-transfected cells, minus Alexa Fluor 647 MFI in nontransfected cells. The ΔMFI positivity cutoff for each dilution was set at the HD mean plus 5 SD; ΔMFI values above the cutoff were considered positive. The titer was defined as the highest dilution yielding positive ΔMFI. For AChR and MuSK, validation was performed by RIA using 5 μl of serum, which is the established standard of serological MG diagnosis in clinical practice (14, 15). Results are reported as the Δ cpm between sample and background. The cutoff value was calculated for every experiment from the HD mean plus 3 SD (33). Because of limited cohort serum quantity, additional HD sera were acquired from the Oxford Autoimmune Neurology Diagnostic Laboratory Biorepository. Samples above the cutoff values were tested in additional confirmatory experiments using 1 μl of serum instead of 5 μl, and with 5 μl of serum and half the amount of Ag; a sample was regarded as a validated positive if it remained above the cutoff in both repetitions. Data were plotted, presented, and analyzed with Prism version 6.0 software (GraphPad Prism 6.0, San Diego, CA). A total of 1287 patients and HDs from four United States–based medical centers were enrolled. The number of study participants in each cohort (RA, T1D, SLE, and neurologic [MS, NMOSD, OND]) are summarized in Table I, along with the number of immunotherapy-naive (at the time of sample acquisition) patients in each cohort. All four cohorts included site-specific, matched, healthy controls. The MS and NMOSD cohort included OND patients as disease controls; their diagnoses are listed in Supplemental Table I. In addition, an MG cohort (both AChR autoantibody positive, n = 20, and MuSK autoantibody positive, n = 20) from the Yale Myasthenia Gravis Clinic was included for assay controls. Representative cell-based immunofluorescence assay flow cytometry plots for all neurologic Ags are shown in Fig. 1. Robot-assisted screening for neurologic autoantibodies was performed on all 1287 serum specimens that encompassed the four cohorts using a cell-based immunofluorescence assay (Fig. 2). Inter- and intra-assay variability coefficients as well as transfection rates for the cell-based immunofluorescence assay are reported in Supplemental Table II. Cell-based immunofluorescence assay cutoffs of HD mean + 5 SD for the different Ags and the different cohorts were as follows: (RA: 24.0 [MOG], 20.2 [AQP4], 1.0 [AChR], 25.5 [MuSK]; T1D: 23.5 [MOG], 1.1 [AQP4], 1.4 [AChR], 32.4 [MuSK]; SLE: 6.7 [MOG], 3.9 [AQP4], 10.5 [AChR], 12.6 [MuSK]; SLE-neuro: 8.5 [MOG], 4.7 [AQP4], 3.4 [AChR], 15.8 [MuSK]; neurologic [MS, NMOSD, OND]: 51.2 [MOG], 1.5 [AQP4], 1.0 [AChR], 28.0 [MuSK]). In the RA cohort, five patients and one HD were positive for MOG autoantibodies, one HD was positive for AQP4 autoantibodies, and two patients and one HD were positive for MuSK autoantibodies. In the T1D cohort, three patients and one HD were positive for MOG autoantibodies, and two HDs were positive for MuSK autoantibodies. In the SLE cohort, two SLE patients were positive for MOG autoantibodies; one SLE patient and two SLE-neuro patients were positive for AQP4 autoantibodies; one SLE patient, one HD, and three SLE-neuro patients were positive for AChR autoantibodies; and four SLE patients, one HD, and one SLE-Neuro patient were positive for MuSK autoantibodies. Finally, in the neurologic [MS, NMOSD, OND] cohort, one relapsing-remitting MS (RRMS) patient, one NMOSD patient, and two HDs were positive for MOG autoantibodies; nine NMOSD patients were positive for AQP4 autoantibodies; and two HDs were positive for MuSK autoantibodies. Of note, none of the OND patient sera, including 10 Susac syndrome, two autoimmune encephalitis (including one N-methyl-d-aspartate glutamate receptor autoantibody-positive encephalitis), two stiff person syndrome, and two acute disseminated encephalomyelitis patients (Supplemental Table I) were positive for any of the four neurologic autoantibodies tested. In the initial screening, performance controls for the AQP4 and MOG cell-based immunofluorescence assays were present in the NMOSD cohort. However, no such controls were present for AChR and MuSK. Therefore, to confirm the performance of the AChR and MuSK cell-based immunofluorescence assays, we used a set of clinical samples known to be both positive and negative for MG autoantibodies. In particular, AChR and MuSK cell-based immunofluorescence assays were performed in sera derived from a Yale MG cohort using mAbs 637 (AChR) and 4A3 (MuSK) as positive controls (31). Results showed that 19 out of 20 AChR and 13 out of 20 MuSK MG patients were positive for AChR and MuSK autoantibodies, respectively (Fig. 3). These results were consistent with those acquired using a commercial RIA; one AChR patient that was negative in the cell-based immunofluorescence assay was low positive in the RIA. In addition, four of the seven MuSK MG patients that were negative in the cell-based immunofluorescence assay were also negative in the RIA. Of note, these four patients were shown to harbor MuSK autoantibodies by commercial RIA at diagnosis at a timepoint prior to acquisition of the samples tested in the cell-based immunofluorescence assay. Serum samples that were identified as autoantibody-positive in the screening assays were next tested with complementary approaches for validation purposes. 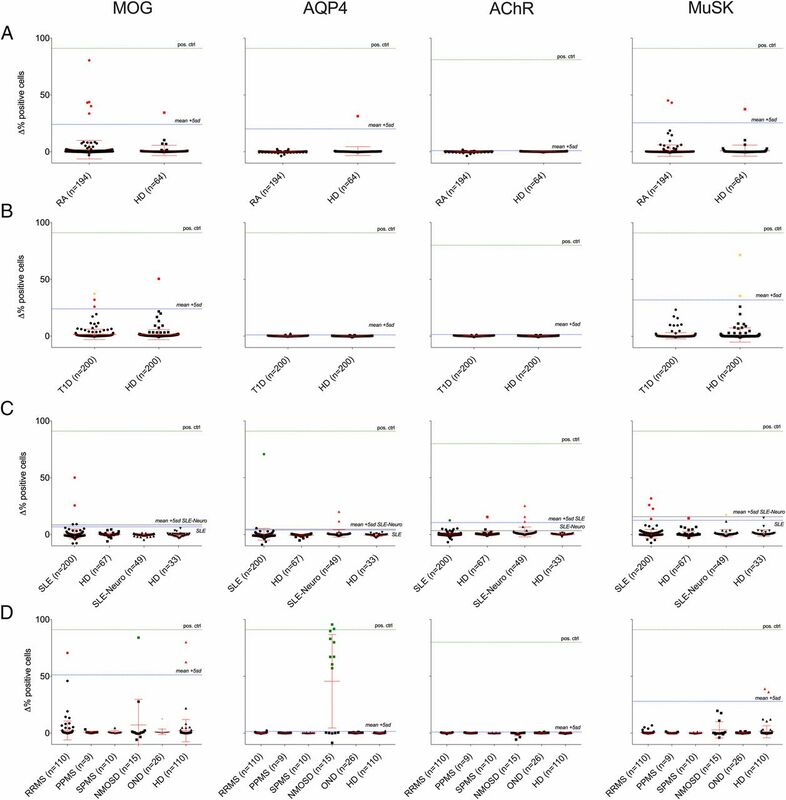 The MOG and AQP4 serum autoantibodies were reexamined in titer-determining cell-based immunofluorescence assays over a wide range of dilutions (Fig. 4). The cutoff titer/dilution was set at the maximum HD-positive dilution. For MOG, as HDs were positive at dilutions up to 1:4050, the titer cutoff was set above 1:4050; samples that displayed MOG binding at a higher dilution were considered to be validated as positive. For AQP4, as no HD was positive at a dilution of 1:50, the titer cutoff was set at 1:50; samples that displayed AQP4 binding at a 1:50 dilution were considered to be validated as positive. The AChR and MuSK serum autoantibodies were reexamined using RIAs (Tables II, III). The validation assays (Supplemental Table III) showed that one NMOSD patient sample was positive for MOG autoantibodies (at a 1:36,450 dilution). Autoantibodies against AQP4 were present in 60% (9/15) of NMOSD patients and one SLE patient. A second SLE patient was found to harbor AChR autoantibodies. None of the serum samples that were initially positive for MuSK in the screening assays were validated using the RIA. In four instances, there was not enough serum remaining for validation of positive screening results: one T1D patient sample initially positive for MOG autoantibodies, two HD samples initially positive for MuSK autoantibodies, and one SLE-neuro patient sample initially positive for MuSK autoantibodies. Two SLE patients harbored autoantibodies against surface Ags of the nervous system. The first SLE patient, a 51-year-old female patient, was positive for AQP4 autoantibodies without having any signs or symptoms of NMOSD. This patient was also diagnosed with RA. The second SLE patient, a 32-year-old female patient, was positive for AChR autoantibodies, consistent with her history of concurrent MG. In the control neurologic (MS, NMOSD, OND) cohort, 9 of 15 NMOSD patients harbored AQP4 autoantibodies, and one AQP4 autoantibody–negative patient harbored high-titer (1:36,450) MOG autoantibodies. All NMOSD patients met the 2015 NMOSD consensus criteria (6). Magnetic resonance imaging from the MOG autoantibody–positive patient’s first clinical attack showed long extensive myelitis and a pontine lesion (Supplemental Fig. 1). Relapses in this patient were no longer observed after B cell depletion with rituximab was initiated. We performed robot-assisted, live cell– and flow cytometry–based immunofluorescence assays against two CNS (MOG, AQP4) and two peripheral nervous system (AChR, MuSK) surface Ags in four large and clinically well-characterized cohorts of patients with autoimmune disease (RA, T1D, SLE, and neurologic [MS, NMOSD, OND]) and matched HDs. Live cell–based immunofluorescence assays constitute a more physiologic approach for screening of serum autoantibodies. These assays offer significant advantages for autoantibody detection compared with other assays, such as ELISA; complex multimeric and membrane-bound Ags are difficult to purify for ELISA-based approaches, and moreover, cell-based immunofluorescence assays present surface Ags in their native structure and with posttranslational modifications such as glycosylation and are therefore more sensitive and specific (34). We performed our robot-assisted cell-based immunofluorescence assay screening in large batches to minimize batch-to-batch variation. We used full-length human constructs so as to better simulate naturally occurring conformations: the α-1 isoform of MOG, the M1 isoform of AQP4, the adult AChR clustered with cytosolic rapsyn, and full-length MuSK. In addition, we used a secondary Ab that does not bind to non-IgG subclasses to exclusively detect IgG Abs and minimize non-IgG false-positive results often produced by IgM (8, 28, 29, 32). Finally, we employed a second level of validation assays to confirm positive results from our initial screening approach. Screening cell-based immunofluorescence assays revealed a higher frequency of MOG and MuSK autoantibody-positive samples compared with AChR or AQP4 (a total of 12/643 [1.9%], 8/643 [1.2%], 5/643 [0.8%], and 4/643 [0.6%] positive samples in the nonneurologic autoimmunity cohorts, respectively). The majority of positive samples in the screening cell-based immunofluorescence assays exhibited a Δ% positive cells that was less than 50%, which was rather low compared with the strongly positive samples and controls, which exceed 90 or 95%. Screening results reflect an increased tendency of MOG and MuSK toward low-to-medium (lower than 50%) IgG binding. After validation experiments, however, neurologic autoantibodies were present in only two cases of SLE. Although cross-disease autoantibodies were rare in SLE patients, such autoantibodies were not found in equally large cohorts of RA and T1D patients. Although it cannot be ruled out that this difference between SLE and RA/T1D is stochastic, it is also possible it reflects a broader reduction of self-tolerance in SLE than in RA/T1D. A broader reduction of self-tolerance in SLE would be congruous with mildly increased alternate autoimmunity, defined by the presence of at least one autoantibody primarily associated with another autoimmune disease, in SLE compared with RA and T1D (35). Moreover, patients with SLE have been known to harbor Abs against various nervous system Ags with or without associated clinical comorbidity (36, 37). In contrast, examination of B cell tolerance with an assay that was used to establish human central (bone marrow) and peripheral (blood) tolerance checkpoints does indicate similar loss of tolerance across different autoimmune diseases including SLE, RA, and T1D (38–40). It should be pointed out, however, that in these studies, tolerance checkpoints were examined by testing new emigrant and mature naive B cell populations with ANA, LPS, insulin, and dsDNA reactivity. In contrast, our serum-based study is different in that it first tested for autoantibodies that are class switched (IgG) and most likely mutated, whereas Abs from naive cells are typically unmutated. Secondly, it tested for autoantibodies against human surface Ags that can be pathogenic rather than those that are limited to disease markers, such as ANAs. We demonstrated the presence of AQP4 autoantibodies in an SLE patient without history of NMOSD. Several lines of evidence point to an occasional association of SLE with AQP4 autoantibody–positive NMOSD. In AQP4 autoantibody–positive NMOSD, autoantibodies that relate to SLE such as ANA and dsDNA are frequently encountered (17). In SLE, AQP4 autoantibodies and concurrent NMOSD manifestations are also reported (36, 37, 41, 42). Importantly, AQP4 autoantibodies have been found to be present in the peripheral blood of SLE patients or in a single healthy individual, both without clinical evidence of NMOSD or CNS involvement (37, 43, 44); in the case of the healthy individual, NMOSD became clinically manifested 10 y later. For disease to manifest, it may be that a second event induces blood-brain barrier permeability to allow serum AQP4 IgG and/or AQP4 autoantibody–expressing B cells to enter the CNS (45, 46). Long-term follow-up of the asymptomatic AQP4 autoantibody-positive patient in our cohort would reveal if and under what circumstances NMOSD will manifest. The second nonneurologic autoimmunity patient who was positive for a neurologic autoantibody was, again, an SLE patient who was positive for AChR autoantibodies. This patient suffered from coincident MG (a fact that was not revealed during the blinded screening). SLE and AChR MG coincidence has been previously reported (47, 48). Moreover, in the context of two SLE patients that were found to be positive for AQP4 or AChR autoantibodies, it is interesting to note that AQP4 autoantibody–positive NMOSD can coincide with AChR MG without the presence of SLE, pointing toward possible common pathogenetic elements between these two autoantibody-mediated diseases (49, 50). By implementing a two-level autoantibody testing protocol in the neurologic autoimmunity control cohort, we were able to verify and refine findings in the newly redefined and rapidly evolving field of NMOSD. Nine out of fifteen NMOSD patients harbored AQP4 autoantibodies. In three of the nine AQP4 autoantibody–positive patients, routine serum and CSF AQP4 autoantibody testing had been negative at a timepoint prior to sampling for the current study. This fact underlines the need for repeated AQP4 testing in NMOSD as previously suggested (6, 51, 52). The frequency of AQP4 autoantibody–positive NMOSD patients (9/15, 60%) was slightly lower than what has been previously reported (28, 53, 54). It remains possible that the M1 isoform cell-based immunofluorescence assay that we used is less sensitive compared with the assay using the M23 AQP4 isoform (53). In addition, our relatively small sample size may not be adequate to accurately reflect reported measures of AQP4 cell-based immunofluorescence assay sensitivity in larger cohorts. Importantly, the primary purpose for our inclusion of a NMOSD cohort was to provide positive cell-based immunofluorescence assay controls rather than measuring assay sensitivity. Furthermore, it should be pointed out that one of the six AQP4 autoantibody–negative NMOSD patients was previously serum AQP4 autoantibody–positive on routine clinical testing but had undergone a plasma exchange and i.v. steroid treatment 3 mo prior to sampling for our study; in addition, this patient was still on an oral steroid taper when the research sample was collected. Steroid treatment has been reported to lower AQP4 titers (52) and could affect seroconversion to an AQP4 autoantibody–negative status. A second AQP4 autoantibody–negative NMOSD patient harbored CSF but not serum AQP4 autoantibodies on routine clinical testing, which is a rarely observed combination (55). In the case of MOG reactivity, we found lower dilution (as high as 1:4050) positivity in SLE, T1D, RRMS, and RA patients, but the same positivity could be found in HDs; thus, this lower dilution positivity is unlikely to be directly associated to underlying disease mechanisms. We therefore set the cutoff at a dilution of 1:4050. In previous work, absence of cell-based immunofluorescence assay MOG reactivity in MS patients and HDs (HD n = 13) was reported to depend on the use of a full-length human MOG α-1 isoform and an IgG1-specific secondary Ab at serum dilutions of 1:20 (32). Other studies, however, based separation of MOG autoantibody–positive patients from MS patients and HDs on serial dilutions; such studies showed that controls (n = 105) were positive for MOG autoantibodies at dilutions up to 1:640 (56, 57). We, however, found that MOG autoantibody positivity of HDs could be found at dilutions as high as 1:4050, and therefore the significance of similar maximal dilution MOG autoantibodies in RA, T1D, and RRMS is not clear. The difference in cutoff between our study and previous studies (11, 58) could be explained by the fact that we tested almost 5- to 10-fold more HDs’ samples (n = 474) and therefore encountered rare cases of higher-dilution MOG autoantibodies in healthy individuals. Differences in cell-based immunofluorescence assay methodology between studies might also contribute to the observed difference in dilution cutoffs. Importantly, our results are in agreement with a recent report from the Biomarker Study Group, where a 1:1250 MOG autoantibody titer cutoff showed better specificity than a 1:160 cutoff for prediction of a non-MS course in a pediatric population (59). Moreover, high MOG autoantibody titers correlated with severity of presentation but not with risk of future relapse in another recent study of adult patients (60). In our neurologic autoimmunity control cohort, only one AQP4 autoantibody–negative NMOSD patient was positive for MOG autoantibodies at a dilution higher than 1:4050 (reaching 1:36,450). Clinical and magnetic resonance imaging characteristics of the MOG autoantibody–positive NMOSD patient were similar to those previously reported (61, 62). Although this is a single case, it is interesting to note that this patient responded well to B cell depletion because resistance to B cell depletion in MOG autoantibody–positive NMOSD has been reported, albeit anecdotally because of rarity of the disease (63). A second AQP4 autoantibody–negative NMOSD patient displayed subthreshold, yet slightly elevated, serum reactivity against MOG in our screening cell-based immunofluorescence assay (Δ% IgG-bound/-positive cells 27.7, below the mean + 5 SD cutoff). It is possible that this patient originally harbored MOG autoantibodies that would have resulted in a positive measurement and that the value dropped posttreatment or because of remission (11, 12, 58, 64). In this patient, the research sample was acquired 7 mo post–rituximab treatment and while the patient was in clinical remission; it should be noted that B cell depletion did not eliminate clinical relapses. For the remaining two AQP4 and MOG autoantibody–negative NMOSD patients, the possibility of new and unidentified Ags in seronegative NMOSD and of serum autoantibodies that are below the level of sensitivity of existing assays should be considered. We performed an extensive screen for four surface neurologic autoantibodies in 1287 well-characterized patients with nonneurologic autoimmunity and controls. We could not detect neurologic autoantibodies in the serum of RA and T1D patients. In SLE, we found, albeit in rare cases (2/200, 1%), patients who harbored neurologic autoantibodies. Because we tested large cohorts it is possible that our findings do not represent a stochastic phenomenon but rather reflect a reduction of nervous system Ag tolerance in SLE patients. In the first SLE patient, the presence of AChR autoantibodies coincided with clinical disease (MG), whereas in the second patient, presence of AQP4 autoantibodies did not coincide with clinical disease (NMOSD). In the case of asymptomatic AQP4 positivity in SLE, prospective studies can clarify whether autoantibody presence precedes clinical symptoms as shown in SLE and RA (1, 65) or merely reflects a nonpathogenic abundance of different autoantibodies, and whether additional events are required for clinical manifestations to develop. Moreover, investigations of human immunology clarifying mechanisms of self-tolerance loss in SLE that lead to production of neurologic autoantibodies will deepen our understanding of human autoimmunity and improve our ability to deliver targeted therapies. Overall, this study shows that autoantibodies against neurologic Ags are confined to specific neurologic diseases. D.A.H. has received personal compensation, outside the submitted work, in the past year from Compass Therapeutics, EMD Serono, Genentech, JDRF, Novartis Pharmaceuticals, Proclara Biosciences, Sanofi Genzyme, and Versant Venture for consulting services, scientific advisory board member services, and training. D.A.H. has received research support/funding, outside the submitted work, from Genentech and Bristol-Myers Squibb. K.C.O. has received personal compensation, outside the submitted work, in the past year for educational activities and speaking from Genentech and New England Biolabs, for consulting services from Proclara Biosciences and Editas Medicine, and for research from Ra Pharma. R.J.N. has received research support, outside the submitted work, from the National Institutes of Health, Genentech, Alexion, Ra Pharmaceuticals, and Grifols and has served as consultant/advisor, outside the submitted work, for Alexion, Grifols, and Ra Pharmaceuticals. The other authors have no financial conflicts of interest. We thank Drs. Marcus Reindl of the University of Innsbruck, Shannon Hinson and Vanda Lennon of the Mayo Clinic, and David Beeson and Angela Vincent of the University of Oxford for providing Ag plasmid vectors. The authors also thank Dr. Claire S. Riley and Gabriella Tosto from the Department of Neurology at Columbia University Medical Center for assistance in obtaining several control specimens. We thank Carla Greenbaum and the Diabetes Clinical Research Unit at Benaroya Research Institute for providing samples from T1D donors and HD. The authors finally thank the patients and the HD who participated in this study and Karen Boss for providing editorial assistance. This work was supported by the National Institutes of Health (NIH)/National Institute of Allergy and Infectious Diseases through a subaward to K.C.O. under Parent Award 5U01Al101990 (to J.H.B.) and through NIH Grants U01AI01934 (to J.A.J.) and AI114780 (to K.C.O.). Systemic lupus erythematosus patients and associated controls were collected and characterized through support from NIH/National Institute of General Medical Sciences Grant U54GM104938 and NIH/National Institute of Arthritis and Musculoskeletal and Skin Diseases Grant P30AR053483. P.S. was partly supported by the Onassis Foundation under the Special Grant and Support Program for Scholars' Association Members (Grant R ZO 006/2018-2019). S.I. is supported by the Wellcome Trust (104079/Z/14/Z) and the BMA Foundation Vera Down grant (2013) and Margaret Temple grant (2017). This research was partly supported by the National Institute for Health Research (NIHR) Oxford Biomedical Research Centre. This work was also supported by grants from the NIH (P01 AI045757, U19 AI046130, U19 AI070352, P01 AI073748, and P01 AI039671) and the Nancy Taylor Foundation for Chronic Diseases (to D.A.H.). The content is solely the responsibility of the authors and does not necessarily represent the official views of the NIH, the National Health Service, the NIHR, or the Department of Health.
. 2007. Meta-analysis: diagnostic accuracy of anti-cyclic citrullinated peptide antibody and rheumatoid factor for rheumatoid arthritis. Ann. Intern. Med. 146: 797–808.
. 2001. Autoantibodies in human diabetes. Curr. Dir. Autoimmun. 4: 252–282.
. 2018. Antibody-mediated encephalitis. N. Engl. J. Med. 378: 840–851.
. 2005. IgG marker of optic-spinal multiple sclerosis binds to the aquaporin-4 water channel. J. Exp. Med. 202: 473–477.
. 2015. International consensus diagnostic criteria for neuromyelitis optica spectrum disorders. Neurology 85: 177–189.
. 2015. Anti-MOG antibodies are frequently associated with steroid-sensitive recurrent optic neuritis. Neurol. Neuroimmunol. Neuroinflamm. 2: e131.
. 2007. Self-antigen tetramers discriminate between myelin autoantibodies to native or denatured protein. Nat. Med. 13: 211–217.
. 2018. Disease course and treatment responses in children with relapsing myelin oligodendrocyte glycoprotein antibody-associated disease. JAMA Neurol. 75: 478–487.
. 2016. Pediatric acquired CNS demyelinating syndromes: features associated with multiple sclerosis. Neurology 87(9, Suppl. 2): S67–S73.
. 2016. MOG-IgG in NMO and related disorders: a multicenter study of 50 patients. Part 1: frequency, syndrome specificity, influence of disease activity, long-term course, association with AQP4-IgG, and origin. J. Neuroinflammation 13: 279.
. 2014. Neuromyelitis optica spectrum disorders with aquaporin-4 and myelin-oligodendrocyte glycoprotein antibodies: a comparative study. JAMA Neurol. 71: 276–283.
. 2011. Antibodies to MOG are transient in childhood acute disseminated encephalomyelitis. Neurology 77: 580–588.
. 1975. Acetylcholine receptor antibodies in myasthenia gravis. N. Engl. J. Med. 293: 760–761.
. 2015. Genetic and epigenetic fine mapping of causal autoimmune disease variants. Nature 518: 337–343.
. 2008. Neuromyelitis optica and non organ-specific autoimmunity. Arch. Neurol. 65: 78–83.
. 2009. A prospective approach to investigating the natural history of preclinical rheumatoid arthritis (RA) using first-degree relatives of probands with RA. Arthritis Rheum. 61: 1735–1742.
. 2010. Diagnosis and classification of diabetes mellitus. [Published erratum appears in 2010 Diabetes Care 33: e57.] Diabetes Care 33(Suppl. 1): S62–S69.
. 2011. The lupus family registry and repository. Rheumatology (Oxford) 50: 47–59.
. 2012. Comparison of autoantibody specificities between traditional and bead-based assays in a large, diverse collection of patients with systemic lupus erythematosus and family members. Arthritis Rheum. 64: 3677–3686. 1997. Updating the American College of Rheumatology revised criteria for the classification of systemic lupus erythematosus. Arthritis Rheum. 40: 1725. ACR Ad Hoc Committee on Neuropsychiatric Lupus Nomenclature. 1999. The American College of Rheumatology nomenclature and case definitions for neuropsychiatric lupus syndromes. Arthritis Rheum. 42: 599–608.
. 2011. Diagnostic criteria for multiple sclerosis: 2010 revisions to the McDonald criteria. Ann. Neurol. 69: 292–302.
. 2017. Human antibodies against the myelin oligodendrocyte glycoprotein can cause complement-dependent demyelination. J. Neuroinflammation 14: 208.
. 2007. Pathogenic potential of IgG binding to water channel extracellular domain in neuromyelitis optica. Neurology 69: 2221–2231.
. 2014. AQP4 autoantibody assay performance in clinical laboratory service. Neurol. Neuroimmunol. Neuroinflamm. 1: e11.
. 2008. IgG1 antibodies to acetylcholine receptors in ‘seronegative’ myasthenia gravis. Brain 131: 1940–1952.
. 2017. Autoantibody-producing plasmablasts after B cell depletion identified in muscle-specific kinase myasthenia gravis. JCI Insight 2: e94263.
. 2015. MOG cell-based assay detects non-MS patients with inflammatory neurologic disease. Neurol. Neuroimmunol. Neuroinflamm. 2: e89.
. 2009. MuSK-antibody-positive myasthenia gravis in a South Asian population. J. Neurol. Sci. 284: 33–35.
. 2015. Use of cell-based assays in myasthenia gravis and other antibody-mediated diseases. Exp. Neurol. 270: 66–71.
. 2016. Autoimmunity to multiple antigens is expanded in at-risk family members beyond the disease specific patterns of the SLE or RA proband. Arthritis Rheumatol. 68 (Suppl. 10) (Abstr.).
. 2018. Understanding the antibody repertoire in neuropsychiatric systemic lupus erythematosus and neuromyelitis optica spectrum disorder: do they share common targets? Arthritis Rheumatol. 70: 277–286.
. 2018. Association of antibodies against myelin and neuronal antigens with neuroinflammation in systemic lupus erythematosus. Rheumatology. DOI: 10.1093/rheumatology/key282.
. 2017. Defective early B cell tolerance checkpoints in Sjögren’s syndrome patients. Arthritis Rheumatol. 69: 2203–2208.
. 2018. Aquaporin-4-autoimmunity in patients with systemic lupus erythematosus: a predominantly population-based study. Mult. Scler. 24: 331–339.
. 2010. Autoantibodies against aquaporin-4 in patients with neuropsychiatric systemic lupus erythematosus and primary Sjögren’s syndrome. Arthritis Rheum. 62: 1198–1200.
. 2015. Anti-aquaporin-4 autoantibodies in systemic lupus erythematosus persist for years and induce astrocytic cytotoxicity but not CNS disease. J. Neuroimmunol. 289: 8–11.
. 2009. A case of NMO seropositive for aquaporin-4 antibody more than 10 years before onset. Neurology 72: 1960–1961. 2017. Glucose-regulated protein 78 autoantibody associates with blood-brain barrier disruption in neuromyelitis optica. Sci. Transl. Med. 9: eaai9111.
. 2009. Intrathecal pathogenic anti-aquaporin-4 antibodies in early neuromyelitis optica. Ann. Neurol. 66: 617–629.
. 2011. Association between myasthaenia gravis and systemic lupus erythematosus: three case reports and review of the literature. Scand. J. Rheumatol. 40: 486–490.
. 1994. The association of systemic lupus erythematosus and myasthenia gravis. Postgrad. Med. J. 70: 741–745.
. 2012. Myasthenia gravis and neuromyelitis optica spectrum disorder: a multicenter study of 16 patients. Neurology 78: 1601–1607.
. 2018. Neuromyelitis optica spectrum disorder presenting with concurrent autoimmune diseases. Mult. Scler. Relat. Disord. 28: 125–128.
. 2007. Heterogeneity of aquaporin-4 autoimmunity and spinal cord lesions in multiple sclerosis in Japanese. Brain 130: 1206–1223.
. 2008. Antibody to aquaporin-4 in the long-term course of neuromyelitis optica. Brain 131: 3072–3080.
. 2016. Multicentre comparison of a diagnostic assay: aquaporin-4 antibodies in neuromyelitis optica. J. Neurol. Neurosurg. Psychiatry 87: 1005–1015.
. 2013. Aquaporin-4 antibodies (NMO-IgG) as a serological marker of neuromyelitis optica: a critical review of the literature. Brain Pathol. 23: 661–683.
. 2009. NMO-IgG detected in CSF in seronegative neuromyelitis optica. Neurology 72: 1101–1103.
. 2011. Temporal dynamics of anti-MOG antibodies in CNS demyelinating diseases. Clin. Immunol. 138: 247–254.
. 2011. Complement activating antibodies to myelin oligodendrocyte glycoprotein in neuromyelitis optica and related disorders. J. Neuroinflammation 8: 184.
. 2014. Antibodies to myelin oligodendrocyte glycoprotein in bilateral and recurrent optic neuritis. Neurol. Neuroimmunol. Neuroinflamm. 1: e40.
. 2017. Prognostic relevance of MOG antibodies in children with an acquired demyelinating syndrome. Neurology 89: 900–908.
. 2019. Usefulness of MOG-antibody titres at first episode to predict the future clinical course in adults. J. Neurol. DOI: 10.1007/s00415-018-9160-9.
. 2016. MOG-IgG in NMO and related disorders: a multicenter study of 50 patients. Part 3: brainstem involvement - frequency, presentation and outcome. J. Neuroinflammation 13: 281.
. 2017. Brain lesion distribution criteria distinguish MS from AQP4-antibody NMOSD and MOG-antibody disease. J. Neurol. Neurosurg. Psychiatry 88: 132–136.
. 2016. MOG-IgG in NMO and related disorders: a multicenter study of 50 patients. Part 2: epidemiology, clinical presentation, radiological and laboratory features, treatment responses, and long-term outcome. J. Neuroinflammation 13: 280.
. 2017. Longitudinal analysis of myelin oligodendrocyte glycoprotein antibodies in CNS inflammatory diseases. J. Neurol. Neurosurg. Psychiatry 88: 811–817. 2014. Preclinical rheumatoid arthritis (autoantibodies): an updated review. Curr. Rheumatol. Rep. 16: 419.